Knowing how brand loyal I am to Rachael Ray, it probably won't surprise you to learn that I am a loyal Google user, too. 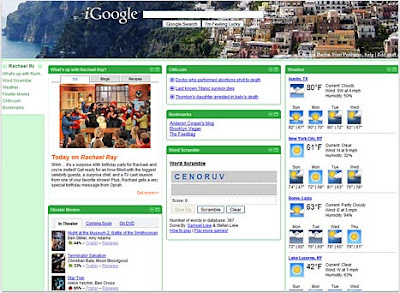 I use Blogger (duh), Gmail, Google Docs, Picassa, Google Analytics, Feedburner, and my homepage is an iGoogle page. Google is showcasing a bunch of celebrities who use iGoogle in an iGoogle Showcase and guess who is included? Rachael Ray, of course. Rach is apparently interested in what's on her talk show, is an Anderson Cooper fan, loves movies, and likes to follow the weather in her favorite places. You can copy Rachael's whole page or add some of her gadgets a la carte. Those Google people are sharp, I'm telling you.